Gear Reviews. 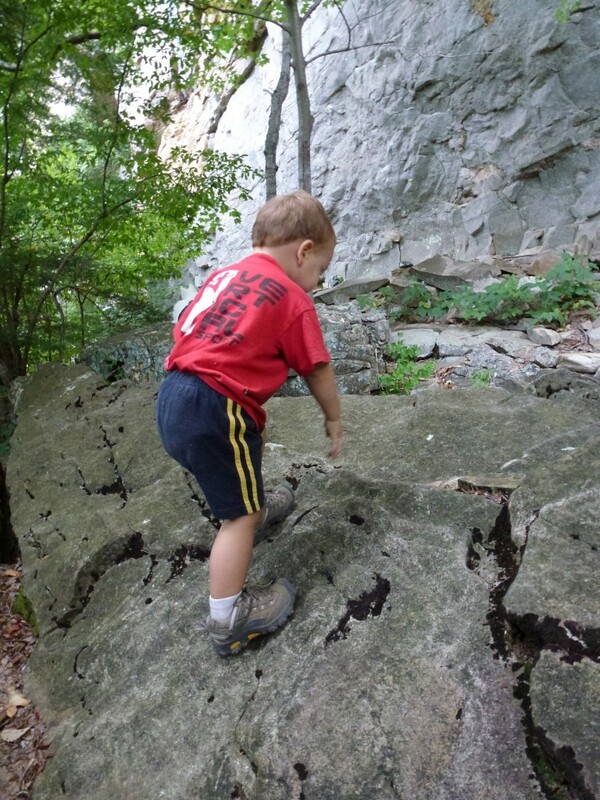 Toddlers at the Crag. 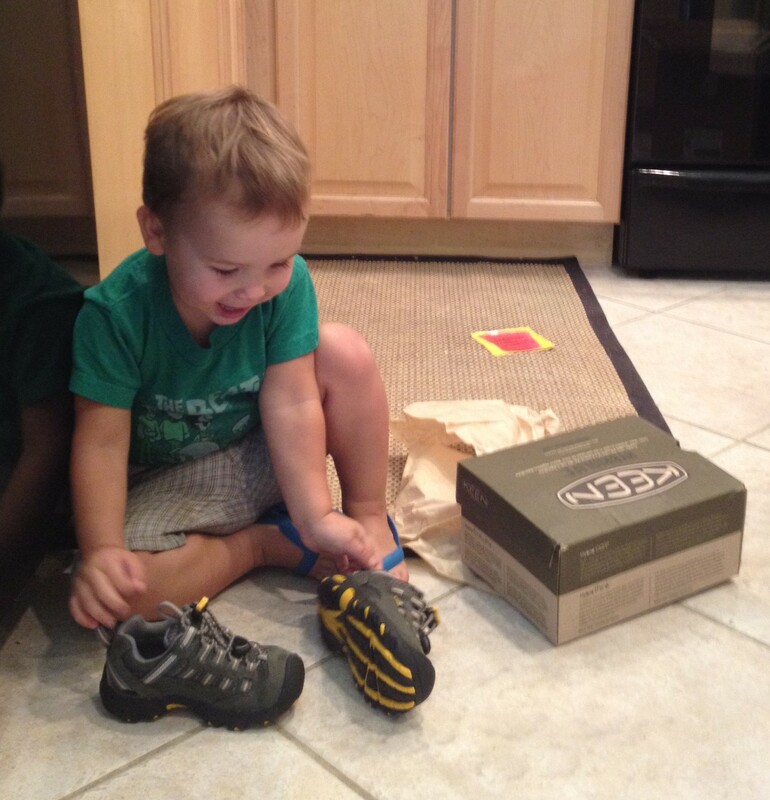 When I first showed Cragbaby the brand new box of Keen Alamosa WP Hiking Boots that had arrived on our doorstep, the first thing he said was, “Peachy Keen.” Really, he did. But it probably had more to do with his current infatuation with the “Veggie Tales” theme song than his knowledge of 1950’s slang. He tore open the box and enthusiastically jumped into my lap so I could help him put on his shoes. While I crammed his wiggly little toddler feet into them, I told them that these were his new special hiking shoes, and that they would help him run, scramble, and explore just like a big boy. He kept pointing at them excitedly, and I was just sure it was going to be love at first sight. I tightened up the laces, and stood him up so he could take them for an initial test spin…at which point he dramatically collapsed back into my lap, begging and pleading with me to take the new shoes off. ?!?!? I didn’t know what to think. Perhaps something was stuck in the shoe – nope. I had ordered a size he could grow into, hoping they’d last longer…maybe they were so big they were difficult to walk in – nope. Or maybe there was nothing wrong with the shoes and C was just playing the stubborn toddler that doesn’t like change routine – ding, ding, ding, correct! I decided not to push, and set the shoes up on his dresser so he could see them. 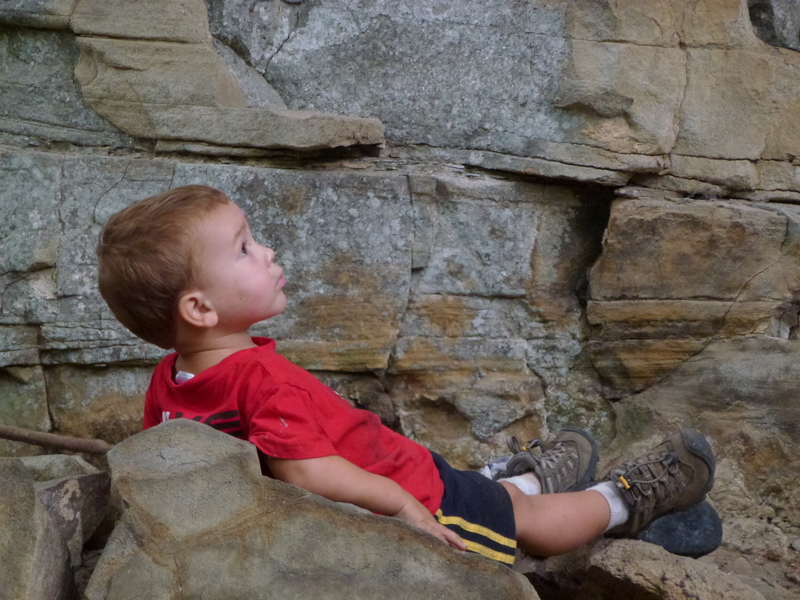 A couple of times a day the Crag-Daddoo and I talked the shoes up and nonchalantly asked if he wanted to wear them. And the response was always a very adamant “NO!” After a couple of weeks went by, I began to get a little worried. I’m always brutally honest with both positives and negatives in my reviews, but it would obviously have been ridiculously unfair of me to cater to my toddler’s mood swings and write that the shoes were so horrible my son could barely stand to talk about them. – LACE-UP SYSTEM – Slingshot laces mean your child doesn’t have to know how to tie their shoe to put them on by him/herself. But hey parents, this doesn’t mean you get to skip out on teaching your kids to tie their shoes…as a former elementary teacher, I was always baffled by the number of 8 year olds that still couldn’t perform what should be a 1st grade prerequisite. – DURABLE – These boots are pretty beefy, and it’s obvious that they are built to last far beyond the life of the average pair of toddler shoes. If your family intends to expand its numbers at some point, these shoes would definitely go in the “save” pile! 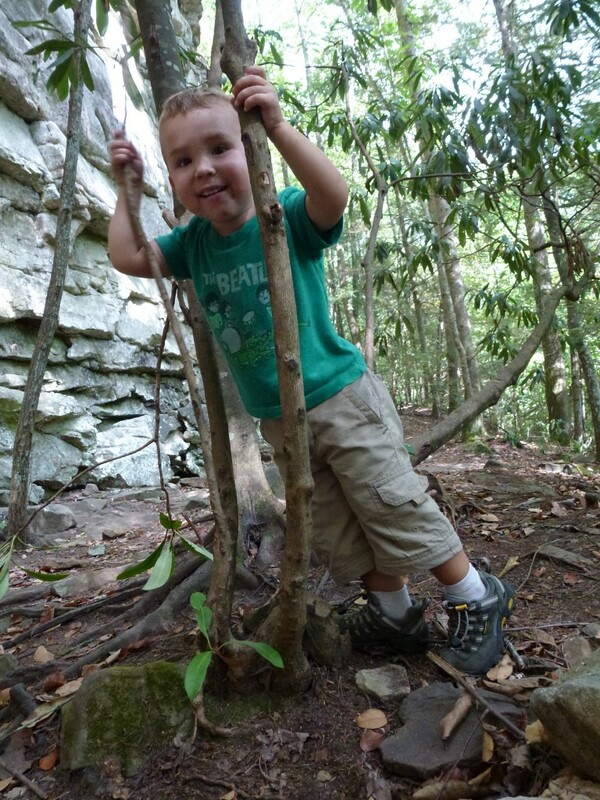 – STURDY – With the terrain that we encounter at the base of the cliff on climbing days, C often wears his climbing shoes all day to help him scramble around and explore. But with the Alamosa’s, the only time he asked to change into his climbing shoes was when attempting to climb an actual vertical rock face. I assume he kept the hiking boots on longer because they were getting the job done, and he felt comfortable and secure on his feet. – My only complaint about Cragbaby’s Alamosa’s is that they are pretty hard to get on, especially when they were brand new. Even though I sized up to get more wear out of them, I still feel like I’m having to shove C’s poor little foot in there, although he doesn’t seem to be bothered by it at all. To be fair, however, these are beefy boots – they have to be stiff to offer enough support, so it’s not surprising that they don’t stretch as much as a regular sneaker. Since we’ve had them for a while they’ve packed out a little bit and on and offs have gotten somewhat easier. Another factor might actually be my fault – although it’s hard to tell right now with those chubby little toddler feet, it’s quite possible that C has inherited his Mommy’s dreaded high arches, which can certainly cause issues with getting shoes on and off. Our family has always been big fans of KEEN. I like their products, and I like that they are encouraging folks to get outside. I also love that KEEN thinks everyone deserve to have a high-quality shoe – the toddler and child Alamosa’s are the exact same as the grown-up Alamosa’s, just in a pint-size package. Because of that quality, these shoes aren’t cheap. They retail at $65 – which at first glance might seem more than you want to spend on a toddler that grows faster than a weed. However, I for one think that shoes are in the “do not skimp” category when it comes to the outdoors. 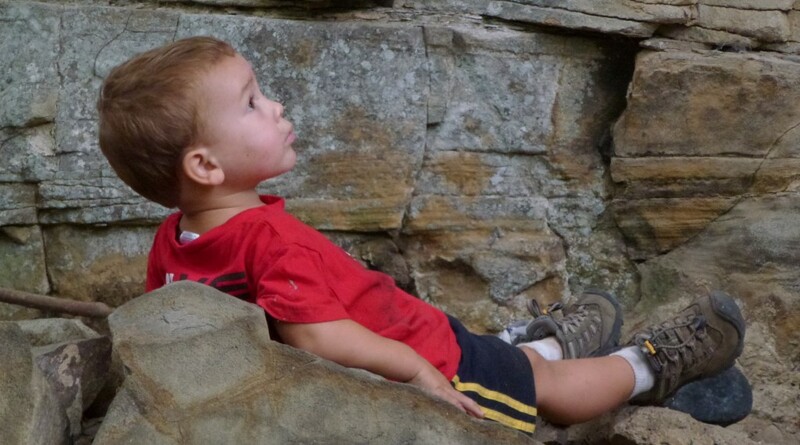 If a child is comfortable outside, odds are good they’ll want to stay outside. And a child that stays outside is a child that has a whole new world of experiences just waiting at their fingertips. In my unbiased opinion, I think the Alamosa’s are a wonderful choice for little guys and gals (and grown-ups too, for that matter!) to explore the world around them. Anyone else have any experience with these shoes? If not, what are your go-to hiking shoes for the small fry? I agree about learning to tie a bow, so my question is, how do you teach kids now that most kids’ shoes don’t have laces? My 5 year old is ready to learn. As for shoes, I also like Columbia and Merrel. Wish someone would make a pair with sticky rubber on the bottom for those rocky approaches like at Red Rocks! Aimee – You bring up a good question. Seems like a decent amount of sneaker/athletic type shoes still have laces, although velcro probably still wins out the majority of the time. There’s always lace-up climbing shoes? 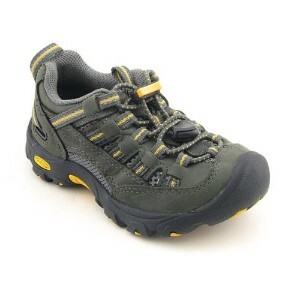 (But I think most if not all of the kid’s climbing shoes are velcro…) I’d love to see a pair of 5 Tennies in kid sizes!!! I love the excited look right out of the box. Many of us are just gear junkies from the start. Kate – I agree completely. We have an awesome kids consignment store in the shopping center across the street from our neighborhood, and pretty much all of C’s clothes come from there! I actually found his first pair of KEEN’s at that store – the sandal type, like you mentioned, and they were in great condition – they really do hold up amazingly well!